You wander through a dark dungeon. All around you there are doors of diﬀerent shapes and colors. You pick one, open it and enter. “I knew you would come,” said a voice in the dark. You come closer and see an old man with a long white beard sitting on the ﬂoor. “So what happened to you?” you ask and sit beside him. – On the way up, you can take either 1 or 2 steps at a time. – On the way down, you can take 1, 2, 3, or 4 steps at a time. As the actual number of ways can be huge, compute the remainder it gives when divided by 109 + 9. 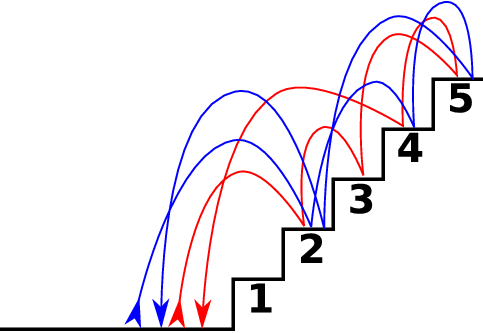 For example, for n = 5 one valid way of going up and down the staircase looks as follows: Start on the ground, ascend to step 2, continue to step 3, and then go to step 5. Having now reached the top of the staircase, you turn around and walk down, ﬁrst descending to step 4 and then going directly to the ground (which is, at that moment, 4 steps below). The ﬁgure above shows two valid ways of going up and down the stairs for n = 5. The one described above is shown in red. – On the way down, you can only walk on the steps you used on the way up. Again, your task is to compute the number of valid paths modulo 109 + 9. In the ﬁgure above, the red path is not valid for this subproblem: on the way down we walk on step 4, which was not used on the way up. The blue path (0 → 2 → 4 → 5 → 2 → 0) is valid. The ﬁrst line of input contains one integer number t specifying number of test cases. Each test case is preceded by a blank line. Each test case consists of a single line with the integer n (1 ≤ n ≤ 100,000) – the number of steps. For each test case print a single line with one integer – the number of valid paths modulo 109 + 9. This output is correct for the easy subproblem K1. For example, when n = 3 there are 3 ways to go up, and for each of them there are 4 ways to go back down. This output is correct for the hard subproblem K2.